From May, 30 to June 5 is celebrated throughout Europe the European Sustainable Development Week. 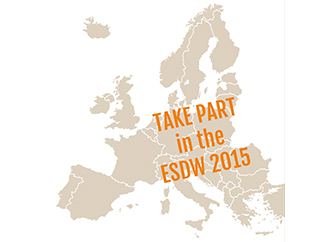 The ESDW is a European-wide initiative aiming at stimulating and increasing the visibility of activities, projects and events that promote sustainable development. In total 3,677 activities are held associated with this action in 28 countries, 40 of them in Spain. Lutz Ribbe, President of the Sustainable Development Observatory of the European Economic and Social Committee: ‘Sustainable development is a challenge which needs not only the commitment of political actors, but requires also a very strong and active role for civil society at all levels, including businesses, trade unions, farmers, consumers and NGOs". For Humana, that commitment is part of its reason for being. As simple as depositing a bag of used clothing in one of our containers or buy clothes in one of our stores makes it contributes to sustainability, overall gesture. European Week actions like this are very positive level of awareness, but it is necessary to go further, becoming responsible for sustainability in all.